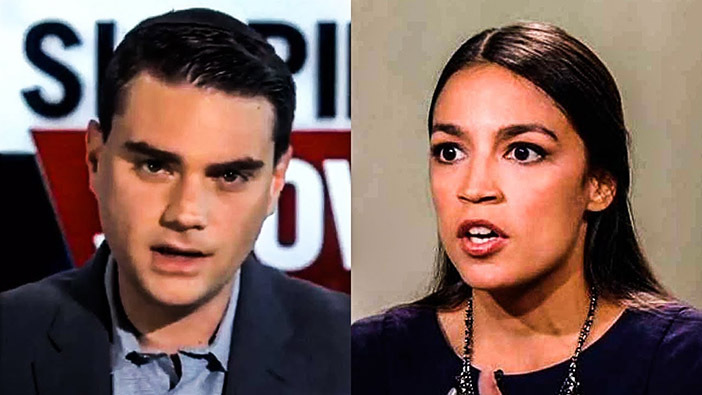 Conservative pundit Ben Shapiro challenged Alexandria Ocasio-Cortez to a debate, offering to pay $10,000 to her campaign or the charity of her choice if she accepts. The Bronx candidate, (who ran on a platform of Democratic Socialism), became the upset winner of the Democratic primary in NY’s 14th Congressional district, has said that Republicans shy away from debates with her. Shapiro, the 34-year-old lawyer and political commentator who has authored seven books and was an editor-at-large for Breitbart News, has called her bluff. “I mean, if she were to get into a discussion with somebody who asks her tough questions, I don’t think she has the information or the philosophy at her disposal to actually answer those questions well,” Shapiro said. “And she knows that, which is why her best move here would have been either to just ignore or to say no. And then everybody would’ve moved on with their life.” Shapiro, who is an avid supporter of Israel, would have likely brought up the topic of her support for Hamas and her harsh condemnations towards Israel. In a recent PBS interview, she called Israel “occupiers” “of Palestine”, though after being further prompted she admitted “..I am not the expert in geopolitics on this issue”. Her supporters were quick to point out that a candidate has no requirement to debate non-candidates, and she is free to choose not to accept a discussion with anyone she feels will be hostile to her opinions. She also likely knows, however, that she doesn’t have a strong chance of persuading undecided independents, but is riding on the leftist liberal ticket. “Well every request is a request. All she had to say here was, ‘Nah.’ That would’ve been fine, I mean she’s got that prerogative,” said Shapiro.